A strong qualification process is a critical component to any successful sales process. The right approach to sales qualification helps both the buyer and the seller navigate successfully through the decision-making process. It helps ensure that the way you sell is aligned with the way customers want to buy. Buyers don’t want to waste time on solutions that aren’t a good fit. The right sales qualification process guides buyers through the requirements, options and risks that are all part of the buying process. Good qualification ensures that your solutions are correctly positioned within each of these stages and aligned with the buying decision criteria. A great sales qualification process also helps sellers by identifying bad news early, such as gaps in customer knowledge or relationships. For the seller, the key is to qualify deals in or out faster, so you can focus on only the highest potential opportunities. This will prevent you from spending a lot of time on deals that were never going to close. 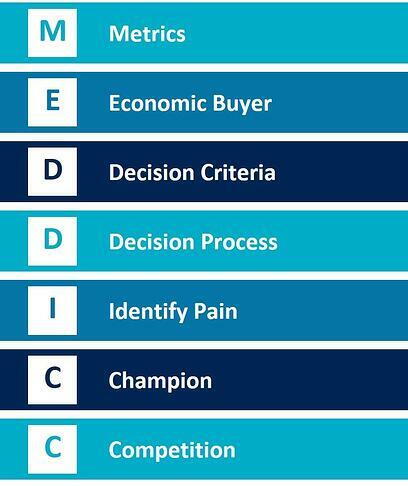 MEDDICC is a proven qualification methodology that supports your sales process. It provides a “litmus test” for gauging the strength of a sales opportunity. Think of it as a GPS to navigate the sales cycle. Using MEDDICC as an internal Sales Qualification Tool helps drive consistent discovery and efficient qualification of opportunities. All the key components of a successful sales cycle are defined and integrated as part of the approach. The right qualification approach ensures both buyers and sellers are aligned throughout the process to optimize their time, define accurate decision criteria, and integrate executive buy-in throughout the decision-making process. Commit to Consistent Qualification: Qualification plays an integral role in supporting how you engage with customers as well as how you execute your sales operating rhythm. Customization is Key: It's important to customize each element of your qualification criteria to ensure relevance for your sales team. Create a Qualification Toolkit: Sales consumable tools, like Opportunity Qualifiers and Opportunity Coaching Guides provide a consistent approach for your sales qualification. Train Your Team: To build fluency around your sales qualification criteria and toolkit, pair interactive instructor-led training with online learning modules. Coach and Reinforce Qualification Criteria: Provide your sales team with easy access to ongoing training and reinforcement materials and make sure your managers have a regular cadence for coaching your sellers to success. Our strength is our experience. Our proof is in our results. Interested in Implementing the MEDDICC Methodology?